Кто нибудь слышал об этом человеке? Ken Holmes, born in London in 1947, went from his studies into a career of chemical engineering, which he left to manage a project helping homeless addicts in central London. The project completed, he set out, in 1970 to find the Sufi and Tibetan mystics he had read about as a teenager. His travels led him through the Middle East and Afghanistan to India, where he spent 6 months in Dharamsala, studying with the monks and lamas around HH the Dalai Lama. From there he went to Kagyu Samye Ling in Scotland, the first Tibetan Buddhist centre established in the West. Kagyu Samye Ling has been his base for the past 36 years, during which time his life has been devoted to making Tibetan Buddhist meditation and philosophy available to the Western world. With his wife Katia, he has co-translated some of the main Kagyu teaching texts into English, as well as much of the liturgy used in daily practice. Their works include the principal Kagyu textbook - Gampopa's Tarjen, published as "Gems of Dharma, Jewels of Freedom" and Asanga's Mahayana Uttara Tantra Shastra, published as "Maitreya on Buddha Nature". In 1977, after five years principally dedicated to the practice of meditation under the guidance of Chujé Akong Tulku Rinpoche, Ken spent six months travelling with His Holiness the Sixteenth Karmapa as his assistant for the European tour. It was during this time that His Holiness encouraged him and Katia to study Kagyu texts intensively and to prepare accurate English translations based upon the traditional lineage explanations. During those six months and in the six months which followed, their studies were closely guided by Khenpo Tsultrim Gyamtso Rinpoche. Following that, they studied under, and interpreted for, Kalu Rinpoche, Khenchen Thrangu Rinpoche, the Tai Situpa, the Goshir Gyaltsabpa, Khenpo Tsultrim Gyamtso Rinpoche and the other masters who spent long moments in those early years at Samye Ling. In the 1990s, Ken studied the principal theories of traditional Tibetan medicine and astrology, under the guidance of the late Khenpo Troru Tsenam Rinpoche, former abbot of Katok and Troru monasteries and holder of two university chairs. The latter gave Ken the dharmacarya (Dharma Teacher) title in 2002. From the Gyalwa Karmapa and these senior lamas, Ken received transmission of many of the main Kagyu sadhanas. However, he was unable to participate as planned in the traditional three-year retreats where they are practised, due to work duties helping Akong Rinpoche develop Samye Ling. Akong Rinpoche therefore encouraged Ken to concentrate on the meditation teachings of the non-sadhana mahamudra tradition, from Saraha. Ken has spent the past thirty years endeavouring to apply these, receiving transmission mainly through the "Ocean of Certainty" text, first under the guidance of Chujé Akong Rinpoché and then twice under the 12th Khentin Tai Situpa. Ken is currently Director of Studies at Kagyu Samye Ling. His life is spent teaching in Samye Dzongs in various countries, assisting Akong Rinpoche, writing and translating dharma works, and he also occasionally interprets for visiting Tibetan lamas. He has also lectured in elementology and astro-science for the Tara-Rokpa College of Tibetan Medicine. He was a founder member of the Scottish Inter Faith Council and has worked with the British Cabinet Office and the European Community on training programmes. He represented Buddhism at the seminal 2002 meetings in Brussels to discuss religious representation in the new European constitution. Я знаю. Кен Холмс- полномочный представитель Аконга Ринпоче, приезжал с ним в Москву на ретрит в 2006 году. Круто. И ведь какя параллель в судьбах с Оле Нидалом! Ken Holmes, born in London in 1947, went from his studies into a career of chemical engineering, which he left to manage a project helping homeless addicts in central London. The project completed, he set out, in 1970 to find the Sufi and Tibetan mystics he had read about as a teenager. His travels led him through the Middle East and Afghanistan to India, where he spent 6 months in Dharamsala, studying with the monks and lamas around HH the Dalai Lama. From there he went to Kagyu Samye Ling in Scotland, the first Tibetan Buddhist centre established in the West. In 1977, after five years principally dedicated to the practice of meditation under the guidance of Chuj? Akong Tulku Rinpoche, Ken spent six months travelling with His Holiness the Sixteenth Karmapa as his assistant for the European tour. ... During those six months and in the six months which followed, their studies were closely guided by Khenpo Tsultrim Gyamtso Rinpoche. Following that, they studied under, and interpreted for, Kalu Rinpoche, Khenchen Thrangu Rinpoche, the Tai Situpa, the Goshir Gyaltsabpa, Khenpo Tsultrim Gyamtso Rinpoche and the other masters who spent long moments in those early years at Samye Ling. In the 1990s, Ken studied the principal theories of traditional Tibetan medicine and astrology, under the guidance of the late Khenpo Troru Tsenam Rinpoche, former abbot of Katok and Troru monasteries and holder of two university chairs. The latter gave Ken the dharmacarya (Dharma Teacher) title in 2002. However, he was unable to participate as planned in the traditional three-year retreats where they are practised, due to work duties helping Akong Rinpoche develop Samye Ling. Akong Rinpoche therefore encouraged Ken to concentrate on the meditation teachings of the non-sadhana mahamudra tradition, from Saraha. Ken has spent the past thirty years endeavouring to apply these, receiving transmission mainly through the "Ocean of Certainty" text, first under the guidance of Chuj? Akong Rinpoch? 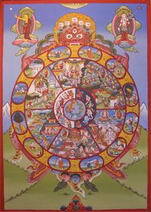 and then twice under the 12th Khentin Tai Situpa. Ещё не прошел трехлетний ритрит. а что раньше вместо нынешнего 9 летнего ретрита, был 3-х летний? Одна из частых претензий к титулу Оле, это что он лама не прошедший трёхлетний ритрит. В Кагью, Ньингма и Сакья во время трехлетнего ретрита сначала обычно тренируются в нескольких сутрических медитационных практиках, а потом в основных ритуальных практиках главных идамов собственных линий, посвещая последовательно несколько месяцев каждой из практик. Трехлетний ретрит в Гелуг сосредоточен на интенсивной практике только одного идама. Не-Гелугпинские школы обычно посвещяют три года или более для ретрита на одной тантрийской практике только в свой второй или третий трехлетний ретрит, но не в первый. Akong Rinpoche therefore encouraged Ken to concentrate on the meditation teachings of the non-sadhana mahamudra tradition, from Saraha. Очевидная параллель + можно проследить определенную тенденцию. Создается ощущение, что Учителя все чаще рекомендуют методы, не связанные с традиционной последовательностью керим - дзогрим. Да, знаеш вот... Слухи поползли, будто ритрит и во сне проходить вполне реально. Большинству тогда по силам не то что три (смешна цифра) а и двенадцать и более лет посвятить ритриту время сна. Заманчиво и в принципе возможно, на условиях . Не для того социальные ключи в настоящее время составляют ещё большую тому преграду, чем если традиционно засесть в пещеру. В этой истории немаловажен тот факт, что после краткосрочного обучения с послушниками и священниками в Дармасале у ЕСДЛ этот чел отправился развивать не Гелук, а Кагью!, все остальное кажимости, чувствуется какой то "политический" контекст. найдите параллели?